Published by Swedish News. Volume 145 No. 9, June 15, 2017. Price per copy $3.50. There is so much going on Swedes in San Francisco In the late 1800s Swedish immigrants in San Franin Swedish America There are many locations in Swedish America that boast all the things we want to know about – throughout the pages of every issue are ads from wonderful businesses and organizations who cater to the demographic that is our readership. In this issue specifically, it’s also clear there are many other kinds of Scandinavian and Swedish destinations in America – from the old and new dining establishments to the many museums and parks that are the sites of all the Midsummer celebrations. And there’s so much more, after all, whenever at least two or three Swedish Americans are gathered together and celebrating their heritage, it’s an event. Nordstjernan reports on all of it. And given the increase in letters and comments we receive (p12), you’re still noticing – even after 145 years! The northernmost province in Sweden is Norrbotten, which borders south to Västerbotten, west to Swedish Lappland and east to Finland. Norrbotten is a fairly young province; it didn’t receive its coat of arms until 1995, after decades of controversy (the idea of Norrbotten as a province evidently took some getting used to). During the Middle Ages, Norrbotten was a no man’s land, sparsely populated by the Samis who lived on hunting, fishing and reindeer herding. But since then, Swedish kings did their utmost in trying to colonize and Christianize the area. Settlers from Finland controlled the trade and even the taxing on the area, which wasn’t tied firmly to Sweden until the mid 16th century. Today, Finnish and Sami minorities live in Norrbotten and have kept their culture and language alive. Since it is as north as you can get in Sweden, let’s take a look at the temperatures: Summers can be surprisingly warm, with an all-time high record of 37C (98F), winters see temperatures drop to -20C (-3F) and below. Name’s Days of the Swedish Calendar Namnsdagar i juni månad. June 19 Görel is an Old Norse name made up of two Old Icelandic words for “spear” and “fight” and may mean “sheltering spear.” Since the 16th century, Görel has been used in noble families and has retained a touch of nobility. It has never been a common name. June 27 The female name Selma is a Celtic name, originating in the town of Shemla, which means “beautiful view.” Selma became common in Sweden at the end of the 18th century after Frans Michael Franzén used it in one of his romantic poems about a woman by the name of Selma. Selma Lagerlöf (1858-1940) was a Swedish author, and the first female writer to win the Nobel Prize in Literature (in 1909). Born at the Mårbacka estate in Värmland, Lagerlöf worked as a country schoolteacher in Landskrona for nearly 10 years while honing her storytelling skills, focusing on the legends she heard as a child. Well-know work: Nils Holgerssons underbara resa genom Sverige (“The Wonderful Adventures of Nils”). founded in new york city in september 1872 Nordstjernan (ISSN 1059-7670), founded in New York City in September 1872, is published by Swedish News, Inc., 570 Lexington Ave, New York, NY 10022 • Readers services and editorial submissions: P.O. Box 1710, New Canaan, CT 06840 Periodicals Postage paid at New York, NY, and additional mailing offices. 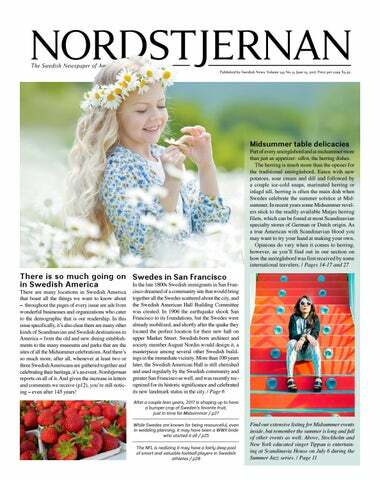 www.nordstjernan.com, Nordstjernan is published semimonthly, except for the months of January, February, July when it is monthly and Augustwith no issue. POST MASTER: Please send address changes to Nordstjernan, P.O. Box 1710, New Canaan, CT 06840 Subscription rates: 1 yr. = $55, Two yr. = $99, outside US 1 yr. = $167. ing through the above text, the poem by the twentieth century author about Swedish nights in June is worth another effort. Nu går solen knappast ner, bländar bara av sitt sken. Skymningsbård blir gryningstimme varken tidig eller sen.
Insjön håller kvällens ljus glidande på vattenspegeln eller vacklande på vågor som långt innan de ha mörknat spegla morgonsolens lågor. This is the creature all the fuss is about ... mostly belonging to the family Clupeidae, better known in Swedish as sill (herring). Your next issue, dated July 15, 2017, will be mailed in early July. New Nordic by SAS Scandinavian Airlines, SAS has stepped up its game when it comes to providing the ultimate Scandinavian experience to their customers. Traditionally, airlines haven’t been known for having the best dining experience but SAS has changed that with their new food and drink concept called The Cube. Inspired by nature and the unique Nordic heritage, travelers who fly SAS will be delighted when they open their meals and experience a delight to the senses. The new food and drinks concept has so far been launched on all its domestic, Scandinavian and European flights. With ingredients such as Norwegian fjord salmon, Swedish lamb and Danish veal with locally grown vegetables, transatlantic flights are hopefully next in line. Volvo wins safety award Volvo has done it again by winning the Euro NCAP award for safety. The V90 and S90 won the highest marks possible for Volvo thanks to the development of technology that keeps drivers safe, especially when driving in the dark. This award-winning safety system isn’t just for drivers, though. Volvo has created extra precautions for both pedestrians and cyclists, too, when sharing the road with Volvo vehicles. Euro NCAP, The European New Car Assessment Program, www.euroncap.com/en Every Swede’s dream car? ... the successor to the XC70 cross country models, the larger V90 Cross Country. Ruben Östlund’s satirical drama The Square, starring Claes Bang, Elisabeth Moss, Dominic West and Christopher Læssø, created quite an impressive festival buzz following its initial screenings at the start of the 2017 Cannes Film Festival. The Square, Östlund’s fourth feature film to compete at Cannes, is preceded by Force Majeure (2014), Play (2011) and Involuntary (2008) but is the first to compete for the most prestigious prize of all: the Palme d’Or. As announced at the ceremony on May 28, The Square was awarded the Palme d’Or at the 70th Cannes Film Festival. “Fantastic! Absolutely fantastic! I am so happy for Ruben and his team. Ruben’s films are a mix of social experimentation and a tradition of literary ideas, and at the point where these two converge he is an extraordinary talent, not just in Sweden but the world over. Moreover, his films inspire discomfort in the audience — in the best possible way.” Pia Lundberg, head of the International Department at the Swedish Film Institute said. The Square is produced by Erik Hemmendorff for Plattform Produktion, and received funding from the Film Institute’s former feature-film commissioner Magdalena Jangard. Coproduction Office is handling international sales, and the film has already been sold to over 50 countries around the world, including the U.S., the UK, France, Brazil, China and Russia. Lights were switched on in Jordan’s Azraq refugee camp thanks to the generous funding from the Ikea Foundation’s program, Brighter Lives for Refugees. In partnership with the UNHCR, a solar plant was created that will bring more than 20,000 Syrian refugees reliable access to electricity. The first solar plant in the world to be placed in a refugee camp, this new venture will reduce both the financial costs of providing electricity – currently running $1.5 million a year – and cut CO2 emissions by 2,370 tons per year. 2017 is a record year for Ikea’s foundation. CEO of the foundation, Per Heggenes, says they will be giving away 4.4 million kronor each day. This record growth will see Ikea giving the equivalent of 1.6 billion SEK this year. Jon Lundstrom (right) is retiring, and Jen LaPointe, a long time coworker at Crown Bakery and Café and her husband Ed will continue the successful bakery, which has been a fixture in Worcester, Mass. since the early 1960s. The Draken Harald Hårfagre, with her unique red, square silk sail, sails into Chicago with a crew of 32 men and women during her tour of the Great Lakes in 2016. Geneva 20-25 June Annual Midsummer Festival - Swedish Days. Singing and dancing around the Maypole, parade, great food, lutfisk tasting, carnival rides, live music, crafts, Swedish entertainment and many children’s games. 630.232.6060 / www.genevachamber.com Lake Forest 24 June, 2-5 PM SWEA Chicago Midsummer Celebration. with our handpainted buoys. Made to order with the flag of your choice. Makes a great gift! Maryland Our office is open Monday to Friday 8.30 am to 3 pm. The mobile passport station will be in Fort Lauderdale September 12-14th. Please contact us for more information. Sunday June 25, 2017 Park opens at 8:30 a.m.
Life made Sweder: NORDSTJERNAN Call 1.800.827.9333 ext. 10 for your own subscription. Dear Editor, Your recent article online seems to imply that Musk ox in Europe are only in Sweden. Do not forget Norway’s Dovrefjell National Park. Wetlandstom, Internet The knowledge of our readers never fails to amaze. You are correct of course and the myskoxen, the musk ox in Sweden are actually from the tribe that was originally introduced in Norway. Our online update merely wanted to note the news of a new baby musk ox in Härjedalen in western Sweden, next to the Norwegian border. The Arctic mammal, primarily at home in the Canadian Arctic and Greenland, more closely related to sheep and goats than to oxen, seems to be doing well in Sweden. /Ed. Augusta’s Daughter Ever wonder what made so many emigrate from Sweden in the nineteenth century? Judit Martin’s novel, “Augusta’s Daughter,” about 19th century Swedish peasant life made such an impression on us, we decided to offer it to the Nordstjernan readership. call 1.800.827.9333 for your own copy ($24.90 incl. S&H to continental U.S.). Zorn’s three plates with herring and löjrom anders zorn’s three favorite plates Here are two recipes with quite a bit of history you can prepare for your own family and guests, along with a plate of löjrom, the whitefish roe that goes so well with herring on the Midsummer table (and if it’s not homemade, herring and löjrom are available at most Scandinavian stores in the U.S., many of which you’ll find advertised in this issue). To serve: Crispbread and Västerbotten, or a similar aged cheese, are essential accompaniments to herring and löjrom. Pickled herring – basic recipe 8 salt herring filets 2 small red onions 1 carrot 1/2 leek Brine 1/3 cup (1 dl) 12% vinegar (you will only find this in Scandinavian specialty stores) 2/3 (2 dl) cup sugar 1 cup (3 dl) water 1 tablespoon allspice berries 1 tablespoon cloves Soak the herring to remove most of the salt. That can take up to 6 hours. (Many a Swede will only rinse the herring well prior to putting it into brine.) While the herring is soaking, make the brine. Combine all ingredients in a saucepan and heat to boiling, stirring to dissolve the sugar. Remove from heat. Peel and slice the vegetables. Add to the warm brine and let cool. Layer herring and vegetables in a jar and pour over the brine. Refrigerate for at least 5 days before serving. Remove the herring from the brine to serve and use half the filets for the next dish. Cut into 3/4 inch slices and serve on small plates. Herring with fresh herbs Half the herring from above recipe Herb sauce 1 tablespoon chives 1 tablespoon flat-leaf parsley 1 tablespoon fresh basil 1 tablespoon fresh tarragon 2 tablespoons crème fraiche or sour cream 2 tablespoons mayonnaise Chop the herbs and place them in a blender. Add the crème fraiche (sour cream). Blend until finely chopped. Fold in the mayonnaise. Remove half the herring from the brine, cut into 3/4 inch slices and stir into the herb sauce. Serve on small plates. Bring water and sugar to a boil, and stir until sugar has dissolved. Rinse the herring in cold water and dry with paper towels. Cut in pieces. Peel and cut the ginger in thin slices. Put the herring in a jar and mix the wasabi and ginger and add. Let sit in the fridge for two hours. Pour the liquid over and put back in the fridge for 48 hours. “Självporträtt i rött” (“Self-portrait in red”) by Zorn, painted in 1915. Part of the permanent collection, Zornsamlingarna, Mora. the smörgåsbord Linnaeus himself served to a visiting English colleague, Thomas Blackwell, in 1765. Blackwell’s verdict was short, concise and devastating: “Catsmeat!” He reported back to the Royal Society that he had firmly refused to even taste the rubbish. The well-meaning Linnaeus had evidently produced the tiny salted, pickled or smoked Baltic herring with which Swedes start their orgies at the smörgåsbord to this day. For those of us who haven’t yet been able to stomach the unique taste of traditional Swedish herring dishes here are a few alternatives. Deliciously fresh Swedish summer mixes with seafood or smoked meat: Skagen, Old Man’s Mix and Suovas. Perfect for a late snack, a light lunch, the midsummer table or any steamy afternoon in the summer of 2017. Skagen mixture gets its name from Toast Skagen, a dish that did not originate in Denmark, in spite of its name. It was invented during the 1950s by legendary Swedish restaurateur Tore Wretman. Old man’s mix (herring-egg salad) makes Swedes think of summer inns and local hotels with white tablecloths, where people enjoyed a lunch of herring, cheese and butter chased by flavored spirits (snaps). Most people who ordered this lunch were men, which is also true of the herring-egg salad known as “old man’s mix”. Souvas means smoked in the Sami language and is in this case cold-smoked reindeer meat. In earlier times, lightly salted meat was hung up by the smoke hole in the tent where the Sami lived. Now there are special tents for smoking. Skagen mix 14 ounces (400 g) fresh shrimp in their shells (7-8 ounces/200 g without shells) 1/2 inch (1 cm) fresh horseradish 3 1/2 tablespoons (1/2 dl) chopped dill 1/3 cup (3/4 dl) mayonnaise 2 tablespoons (1/4 dl) creme fraiche or sour cream Salt and pepper 2 teaspoons Dijon mustard Shell and coarsely chop the shrimp. Grate the horseradish, chop the dill and combine with the mayonnaise, creme fraiche and shrimp. Season with salt, pepper and Dijon mustard. Cut the smoked reindeer into fine dice, chop the onion and parsley, and combine with the mayonnaise and crème fraiche. Season to taste with mustard, salt and pepper. Suovas, which means smoked in the Sami language, is salted and smoked reindeer meat. Suovas is one of the oldest means of food preservation in Sweden. The meat is salted for a few days before it is smoked. Recipes: KG Wallberg / Photography: Bruno Ehrs Recipes are from the recipe book “Wonderful Sweden” – a culinary journey through Sweden, from Skåne in the south to Lappland, covering provincial specialties, points of interest and traditions. Sweden’s Honorary Consuls in the U.S. Who are they? In an effort to find out more about the Swedish consuls in America, the work they do and the people they represent, contributor Helen Teike interviewed each of them,published here throughout the year. of its religion with MTC language training facilities. 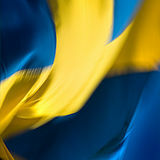 It facilitates surrogacy birth certificates for pending Swedish parents. How much are you guided by directions from the embassy in Washington, DC? In the event of an emergency, I contact the embassy to reach a timely solution. The Washington Embassy has done a fantastic job providing yearly training in all consular matters and emergency issues that may arise. What is your personal connection with Sweden? I was born and raised in Sweden. I absolutely love the Northern Lights and every season. I love the people and what we stand for. I am a dual citizen. What made you choose to accept this position? I have always wanted to be a consul. This provides me the opportunity to serve my country from the United States and be close to the culture. Honorary Consul Cecilia Hahn Consulate of Sweden World Trade Center at City Creek 60 East South Temple, 3rd Floor Salt Lake City, UT 84111 801.937.9093 saltlakecity@consulateofsweden.org a beautiful land with many large naturally occurring lakes, rivers, and forests. Sweden is one of the original locations of the Vikings, but is today a very diverse country welcoming people from various parts of the world. I explain special holidays like Santa Lucia and Midsummer. I also explain the relationship between Sweden and US in terms of import, export, and current economic development efforts. On being Swedish: We value family, equality, and invest in what life is really about. We care about the health of our planet with much respect for nature and animals. We are highly intellectual and world travelled, understanding technology and strides within medical research. We appreciate music, art, fashion, and history. We strive for international solutions and world peace. Sweden recognized the United States on April 3, 1783, when the Treaty of Amity and Commerce between the United States and Sweden was signed in Paris. The Kingdom became the first country not formally engaged in the conflict to recognize the United States of America before the Treaty of Paris. Sweden appointed its first consul to the United States, Charles Hellstedt, on September 22, 1783, who was accredited on December 3, 1784. The Swedish minister in Paris approached Franklin in 1782 with the suggestion of concluding a treaty between the two entities, remarking that he hoped it would be remembered that “Sweden was the first power in Europe which had voluntarily and without solicitation offered its friendship to the United States.” Franklin informed Congress of this initiative and was then empowered to negotiate with Sweden. Diplomatic relations were established in 1818 when the United States named David Erskine as the first Consul to Stockholm on May 22. On September 20, 1947, H. Freeman Matthews was appointed to be the first U.S. Ambassador to Sweden. Mathews presented his credentials on December 5, 1947. About Swedish food: I drink coffee and still enjoy sill och nubbe! Most admired Swede: Raoul Wallenberg The biggest misconception about Sweden: People think it’s a socialistic country. And there’s a stereotype that Swedes have a formality about them, a little bit of distance and coldness until you get to know them. On being Swedish: It means trying to be humanitarian, tolerant, working in ways to protect the rights of the poor and the disadvantaged, like Raoul Wallenberg. Become a Fandinavian! Al Johnson's Wild Organic Swedish Lingonberries All organic, 55% berry concentration provides authentic Scandinavian flavor Special Fandinavian pricing: For 20% off, enter code "lingon20" at online check-out Pick up an Al Johnson's gift certificate! Available in the Butik and online at aljohnsonsshop.com. bers, not merely for founding this association, but who, immediately following the 1906 earthquake and fire that destroyed almost half the city, bought this property and erected this building, the masterpiece of Swedish-born, San Francisco master architect August Nordin. around the world, the city took over all municipal transit, built many hotels to accommodate guests, and built many meeting halls, where fraternal, ethnic, and beneficial societies could meet. During this period many, if not most, San Franciscans were living in tent cities and were standing in long bread/soup lines. On this block, what is now the Lucky 13 bar was then a small, streetlevel gathering hall. Across Market Street on the same block was another type of meeting hall — a two-story building, with commercial space on the ground floor and one or more halls on the second story; it is another of the 400 local buildings designed by August Nordin. An example of the third type of building is the Swedish Society’s Swedish American Hall, also designed by Nordin, who thus had two buildings, across the street from each other on this same block. The Swedish American Hall had two retail units at street level (now combined into a single restaurant) and one of San Francisco’s oldest bars beneath the sidewalk level, as well as multiple meeting rooms and halls above. Also included was a private dining room and kitchen on the mezzanine, and board- and reading rooms on the third floor. The reading room is where many immigrants would gather to read books and periodicals in Swedish as well as to converse with other immigrants in their native language. August Nordin’s architectural drawing of his masterpiece, the Swedish American Hall. was opportunity for everyone to break into song, singing Happy Birthday — in both English and Swedish. When Swedish Consul General Barbro Osher was called upon to speak, she congratulated the Society for building the hall, which has hosted so many significant Scandinavian events. Originally a men’s society, she reflected that the hall is equally, if not more indebted to the Swedish Ladies Society of San Francisco, the women’s auxiliary and complementary organization, that contributed so much to the building, to hosting events at the hall, and to its mission. Nina Webber, president of the Swedish Society of San Francisco (now fully integrated), also spoke, thanking all past and current members and board members who have made the hall historic and home to so many organizations. With that, Enrique Landa and Dylan MacNiven, the Upper Market Vikings, were called upon. As the master tenant of the hall, their business acumen and investment made it possible for the Society to renovate the hall and retain its reputation as a beloved city nightspot, now for concerts in the main hall as well as for more intimate concerts in Café Du Nord. Finally, Consul General Osher and President Webber unveiled the landmark plaque, while she read the plaque’s inscription: San Francisco Landmark No.267, Swedish American Hall, 2174 Market Street Built in 1907, Swedish American Hall is home to the Swedish Society of San Francisco, founded in 1875. August Nordin in the Arts and Crafts style, the architectural finishes demonstrate a superior level of craftsmanship in a rich palate of materials and ornament. Interior lodge rooms named after Norse gods feature soaring truss work and intricate wood detailing. gelser Amerikanska presidenter och andra har under decennier försökt finna lösningar på tvisten. Ofta förhandlingsvägen med mjuka formuleringar och tänkbara vägar. Nu försökte även Trump. Så vitt jag kunnat läsa ut av hans ansträngningar använde han sig av en kärvare ton och uppriktighet. Han försökte med bestämdhet få dem att träffas, se varann i ögonen och inse, att de helt enkelt nästan måste finna kompromisser. Fortsatt strid leder endast till fortsatt elände. Genom sitt klara, uppriktiga och burdusa budskap hoppas jag han hade inverkan. Jag kan bara hoppas att mitt omedelbara intryck stämmer, att Trumps agerande medverkar till sämja. Han gjorde i varje fall ett modigt och uppriktigt försök att agera som en gentleman. Det ger mig en glädje och borde ge oss alla en glädje att konstatera detta. not my time to die Titanic and the Swedes on Board by Lilly Setterdahl The 123 Swedes on board made up the third largest ethnic group on the Titanic after the American and the British. The book profiles each of the Swedish passengers; including the 34 survivors... Perfect bound, large size paperback, 296 pages. Richly illustrated. Call: 1-800-854-6435 WE SHIP ANYWHERE IN THE US! Dala Horses and much more! Give us a call! Vi tål att jämföras. 415.552.5300 Proudly serving our community since 1988.
t solution for every t rip! Talar svenska, energetic and reliable! A memoir about the life of a Swedish immigrant as told by her poet-daughter Marion Palm. Available now: www.xlibris.com paperback $15.99 E-book $3.99. A humorous collection of essays about growing up, reaching adulthood and maturity on two continents and in two separate cultures. Loved by Rednecks, Bluenecks, Swedes and Americans: “… something any Swedish American will enjoy” … “A humorous look at Swedes and Swedishness” … “[written with] the gift of clarity, humor, pathos, and joy” A book from Nordstjernan, also available on Amazon. Where do the wealthiest Swedes live? If you guessed in the capital city of Stockholm, you’re correct. The municipalities located directly around this popular city have the highest concentration of millionaires whereas 12 other cities in Sweden don’t have even a single resident earning at least 1 million kronor. Resia, the winner of Sweden’s Best Travel Awards for 2017, predicts three trends to watch for when in the Swedish travel business. Smartdigital services, personal concierge services, and health-workout services top the list of what business travelers are looking for. The hotels who can balance all three aspects are expected to corner the lucrative business traveler market. A chance to own a piece of Astrid Lindgren history is now possible. Her father’s childhood home, featured as the middle red house in her books and movies set in Bullerbyn, is for sale in Sevedstorp, Småland, which isn’t far from the Astrid Lindgren Museum in Vimmerby. Less than one million SEK will earn you the perfect chance to own this piece of classic Swedish nostalgia. A shipwreck was found in an inlet near Karlskrona in southern Sweden, when a diver, who spends his time looking for deep sea wrecks, happened upon what is believed to be a vessel that was deliberately sunk almost 200 ago. The practice of sinking ships to avoid enemy detection has turned up surprising finds and may help historians explain how maritime defense was conducted centuries ago. Just in time for summer, the National Board of Health reports that cases of skin cancer are on the rise. Specifically, malignant melanoma is being diagnosed at an alarming rate with the number of cases almost doubling in less than a decade. It’s suspected that Swedes, who turn out in droves when the sun shines, fail to take precautions to protect themselves from overexposure to the sun. Digital healthcare in Sweden is set to increase. With the advent of digitization in areas like Xrays and operations, the cost of healthcare is expected to fall while the use of technology to assist healthcare professionals is expected to continue to increase. And instead of lengthy waits in long queues, Swedish patients will see many of their appointments taking place in their own homes instead of their local doctor’s office. In a very close and exciting game, Sweden dethroned two-time defending champion Canada to win the world hockey championship 2-1 on May 21. Two shootout goals helped the Tre Kronor win their first International Ice Hockey Federation title since 2013 and prevent Canada from a three-peat. It was Sweden’s 10th world championship win since 1953. 20% area sq. inch = 6.75 divided by live area width = .71" warning height Warning is 21 pt. Swedish-American "war bride" Kerstin Kahlow whose unique parachute wedding dress has once again crossed the Atlantic and is exhibited at the army museum in Halmstad. The pilot Pete Petersson, USAAF, of SwedishAmerican descent, and his B-17 Flying Fortress are in 1944 hit hard by air defense over Germany, but the pilot manages to Girls outrank boys miraculously save his plane and For a country that prides itself on equality, the crew to Sweden. Pete becomes results of the latest series of tests regarding stuhead of a group traveling around dent performance is causing concern. Both in Sweden to repair the emergency curriculum and in the softer skills like “kindlanded U.S. planes that can be ness”, girls outperform boys. Some say that salvaged. During one of the trips this has nothing to do with actual intellectual he meets young Kerstin Kahlow ability and more to do with girls knowing how from Halmstad. They fall deeply to adapt to the school environment in ways that in love and are about to get marbenefit them with their teachers than boys do. ried. But there is textile rationing in Sweden, so how does a young Gothenburg goes boom! bride get enough rationing couBusinesses in Gothenburg report an uptick that pons for a wedding dress? has them looking to increase profit and new Kerstin comes up with the employees. On a scale of -100 to +100, a rating amazing idea of using her husof 40+ is considered a “boom,” and the 1,000 band-to-be's parachute for the businesses surveyed had a result of 43+. That dress. In the evenings and nights means Gothenburg is thriving along with the she sews a marvelous wedding rest of Sweden, and if the trend stays stable the dress of a material so nice that no economy points to a strong future. one in Sweden has seen anything like it, and a glorious wedding is New Swedish craft at Sofiero held at Sperlingsholms Chapel in an exhibit with Swedish artists described as a Halmstad. combination of the Arts and Crafts movement The film’s director, Jan-Olof with a bit of Swedish ingenuity added is howNilsson was truly amazed: “I ing at Sofiero Castle outside Helsingborg this was so impressed by Kerstin's summer. For more info, see www.sofiero.se story that I simply had to travel Wartime wedding at Sperlingsholms Chapel, Halmstad. to America to film this 94-yearold wonderful woman. It was an unforgettable meeting. When the staff at the museum in Halmstad watched my movie on TV they SWEDISH DVD WITH ENGLISH SUBTITELS were excited and asked me to 1200 AMERICAN AIRMEN contact her to ask if it was possible to borrow the dress for SUCCEEDED IN REACHING a special show about the war y lsson b SECURITY IN SWEDEN lm Ni a fi -Olof years.” e g a l vil Jan DURING THE END OF WW II ur oo Kerstin and her wedding dress et m a c ans ric MAIL YOUR ORDER TO: are really the main attraction. ame e h nt jan.mark@telia.com. Please send check whe So now, this beautiful bridal payable to: Jan Mark, 102 Fireside Lane dress has once again crossed the Holden, MA 01520 Atlantic—truly a wedding dress + $4 SH, TOTAL $23.95 More info: www.historieresan.se with an extraordinary SwedishAmerican history. For more info on the movie, see www.historieresan.se The dress made from Pete Petersson’s NORDSTJERNAN parachute is now on display at the museum and the Halmstad museum at www.91anmuseet.se in Halmstad, www.91anmuseet.se. Call 1.800.827.9333 ext. 10 for your own subscription. The year’s first “jordgubbar” have arrived and Swedes are stocking up on this delicious berry as they plan their summer holidays. Considered the most popular berry in Sweden, sales spike during Midsommar and remain strong for those long, lazy weekends and summer holidays. After a challenging winter and a short season last year, this year’s crop of strawberries is predicted to last well into August. Few things are more summery and Swedish for dessert than strawberries. Here’s a variation on the serving of the mandatory strawberries that will make everyone happy. Our first encounter with the variation of the Pinoccio torte was at the former Swedish Consul General to Michigan’s residence where the Consul’s spouse Karin Johansson added some delicious details to this traditional cake. swedish dvd releases Order Swedish language movies on DVD. All videos are in the original language with English subtitles. Strawberry cake á la Karin (AKA Pinocchio Torte) Line a 12” x 16 “ sheet cake pan with baking parchment. Grease well and add flour. Sponge cake: 3 egg yolks 1/2 cup (1 dl) sugar 5 tablespoons Half & Half 2/3 cup (1-1/2 dl) melted butter 2/3 cup (1-1/2 dl) all purpose flour 2 teaspoons baking powder Mix flour and baking powder in a separate bowl. In another bowl, beat the egg yolks and the sugar well until light and fluffy. Add the Half & Half and the cooled butter to room temperature, a little of each at a time with the combined flour and baking powder. Pour into the prepared pan, spreading the batter with a spatula. Meringue: 3 egg whites 3/4 cup sugar 1 teaspoon vanilla sugar 1/2 cup sliced almonds Beat the egg whites until stiff. Fold in the sugar and vanilla sugar and beat for a few more minutes. Spread the meringue, slightly unevenly over the cake batter. Sprinkle with almonds. Bake on the lowest oven rack on 400F for 5 minutes. Lower the oven temperature to 350F for another 20 – 30 minutes until the meringue is golden. Let the cake cool slightly. Carefully remove the cake from the parchment paper and cut in half. Filling: 1 1/3 cup whipping cream 1 ½ liter strawberries (1.5 quart—you don’t have to be picky here… experiment!) Whip the cream and combine with mashed strawberries (leave some for decoration). Spread the filling on one of the cake half and top with the other half, meringue side up. Decorate with Strawberries. Enjoy! (Anyone who’s tried Swedish strawberries will agree they’re simply better than others. Sweeter, less water and more flavor. Endast Sverige svenska krusbär har. [Only Sweden has Swedish gooseberries] From “Om svenska rim” 1838 - praise for Scandinavia and Sweden by Swedish author Carl Jonas Love Almqvist (1793 - 1866). So true about strawberries, and some other things, too. The NFL is realizing the wealth of talent that could be available to teams as it casts its eyes on Europe. Sundberg credited much of the growing interest in the NFL to television and internet coverage, which has put the American sport in the homes of many Europeans. “It is on a lot of Swedish TV now,” Sundberg said. “It’s just cool to watch and we are getting more and more interest.” The growing interest in watching the NFL has begun to generate interest in playing American football, and Sundberg and the Crusaders have mapped out what they believe is a winning game plan for developing the sport in Sweden. “We have Under-19, -17, -15, -13, and -11 teams. There are more than 200 players in the club and now we are doing flag football teams. Junior football is growing and now I think there is an understanding among the Swedish clubs that you have to grow it from the ground up.” Sundberg said he sees “four parts” to the sport’s success in Sweden: “First, you have the NFL on TV and you have to keep having it on TV,” he said. Right now, the main path for Swedes to get close to the NFL is to play for an American university. That, however, could change; Waller said the league now realizes the depth of talent available in Europe and is looking to improve on how it finds that talent. “The honest answer [for how we follow leagues overseas] is on a very ad hoc basis and, at the moment, with no real formal process for tracking and measuring it,” Waller said. “It’s probably an area where we could really get better, because where you have these leagues starting up and these teams playing, it would be incredibly useful for us to know what the standards are and potentially scouting players.” A number of NFL teams have connections to international football teams. The Oakland Raiders have something of a sister team in Austria, called the Swarco Raiders, a relationship that has included hosting coaches at training camp in Napa and running Swarco’s game recaps online. The London Warriors’ defensive coordinator, Aden Durde, spent last summer as an intern for the Dallas Cowboys; this year the Cowboys signed one of Durde’s players. The Crusaders beat the Warriors to reach the NEFL final. Germany is the top international country with 11 players in the NFL, nine of whom have been drafted since 2008. A record 12 foreign born players were selected in the 2016 draft. “There are definitely some good players here,” said Crusaders “import” running back/strong safety Alpha Jalloh. The Liberty University grad went to Sweden specifically to prepare for NFL summer camps and said the level of play surprised him. “About the only big difference is the game speed. It isn’t as fast as it is in the States, but there are a lot of good players here,” Jalloh said. “The London Warriors were a good team. There are lot of guys here who could easily play college ball back home.” Jalloh is exactly the type of player Sundberg said he wants to bring to Sweden. “We used to look at Division 2 or Division 3 players but now we want the guys who are right on the edge of making the NFL,” Sundberg said. “We want to give them the chance to prepare for NFL camps and we want them to teach us and make us better.” In the next issue, find out about a young athlete and an example of a Swede who grew up in the American football environment in Sweden and now plays for a college in the United States. /ed.